Get your blinds repaired by an expert. We serve all of Northern Colorado! Are you not happy with the appearance of your blinds? Have you been looking for high quality window coverings to complement your home or workplace? Get in touch with the pros at Blinds, Decor and More. We are a full-service blind repair and window treatment company serving northern Colorado region. Whether you need to get your blinds repaired or you're searching for the perfect window coverings to enhance your decor, we've got you covered. At Blinds, Decor and More we know that maintaining a welcoming or professional appearance in and around your home or business is a top priority. Rest easy knowing you're partnering with a company that has years of experience working with window coverings. From installation and replacement to comprehensive repair services, you can trust us to outfit your home or office with the highest quality window treatments. 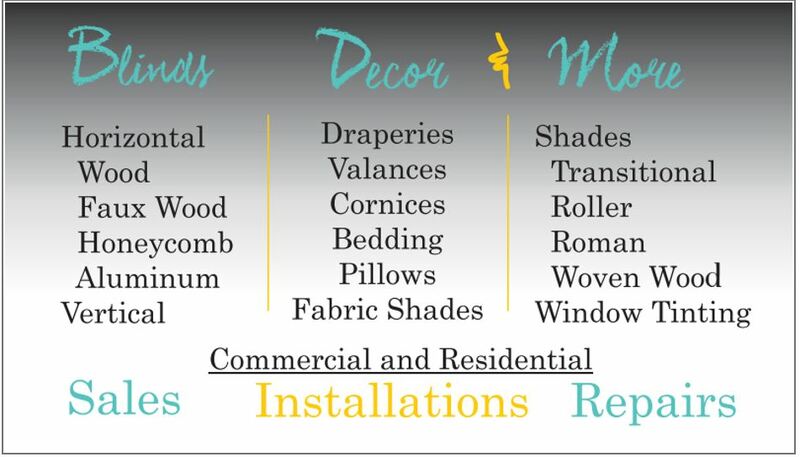 If it's time to update the blinds throughout your home or office, Blinds, Decor and More is at your service. Explore the latest in residential and commercial window treatments by calling 970-218-5974 to schedule a free estimate. We are priced competitively and offer a mobile showroom service for your convenience.